I slept late, yet again, but this time it wasn’t because of Voice. Ferdz told me that I’m using up a lot of CPU resources for the site so I upgraded Justwandering to WordPress 2.8. I also upgraded the plugins, but in the middle of it all, one of the plugins borked my site. I was in the middle of trying to figure out what happened, when the internet suddenly went off. No choice but to sleep then. I woke up before my alarm did, and though I can go back to sleep, I ended up online again, trying to fix my site. I managed to fix it in time before I had to go down to meet Wei. Wei took me to this popular roti canai place. Roti canai is a typical breakfast food, and true enough, the sidewalk where the stall was located was full. Unlike in Manila where we usually eat roti as an appetizer dipped in curry sauce, here it was served with meat and curry sauce, and eaten like rice. We had teh tarik, or pulled tea to go with it. Afterwards, we took a walk down the street to the Campbell street market, which reminds me of divisoria, but in a smaller scale. 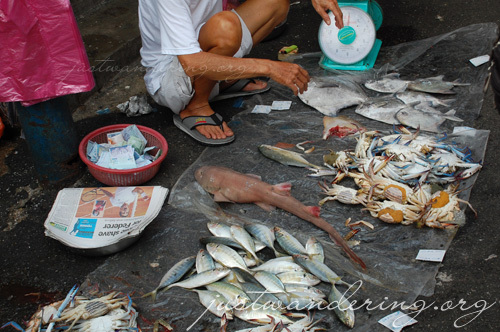 There were different kinds of wares for sale right there on the street, along with fresh vegetables, fruits and different kinds of meat and seafood. We walked and drove around (sometimes in circles), killing time before the Blue Mansion opens. Any idea what that big fish is? 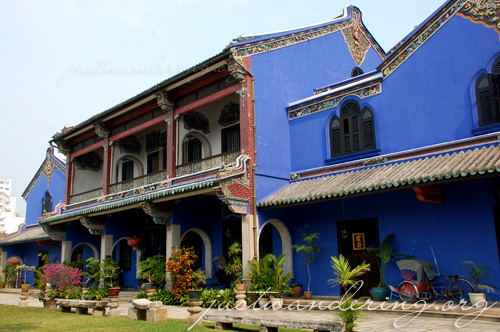 The Blue Mansion is one of the most elaborate residences of Cheong Fatt Tze, one of the region’s legendary businessmen. Admission to the beautifully restored mansion cost RM12 per person, and is only allowed at 11am and 3pm, where there is a guided tour scheduled. The tour was well worth the admission, and it pointed out features of the mansion that you can easily overlook. 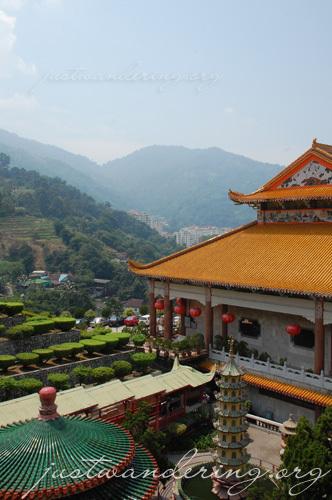 The tour and the mansion gives a glimpse of Cheong Fatt Tze’s colorful life, as well as an overview of the traditions and the culture of the Chinese. The tour takes about an our and a half, so better get something to eat before going in and bring some water, since it can get pretty hot inside the mansion. 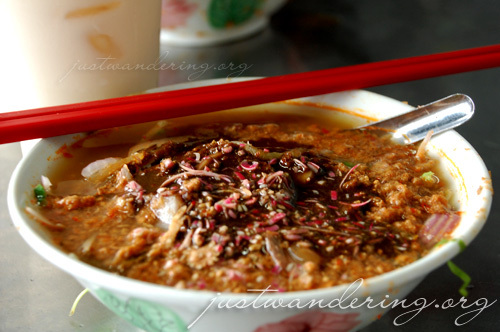 We drove out of Georgetown to Air Itam, to have the best Laksa in Penang. Like the roti canai stall, it was located on the street just outside the morning market. The first laksa I’ve ever tasted was my sister’s attempt at making one using an instant mix. The laksa I had in Penang was a far cry from that first laksa. It was a spicy, sour, sweet and salty at the same time, and the mint leaves takes it to different heights. I can’t exactly pinpoint how they make it, but that was really good. Definitely worth getting soaked in the sudden downpour. Lunch had a part two: char kway thing, which is totally different from char kway teow. It’s a simple noodle soup made with clear broth. It was a good follow up to that very flavorful laksa. There was a buddhist temple up in the nearby hill, and that was our destination after lunch. It was.. interesting. There were three huge buddhas in the first temple, with thousands of small similar buddhas along the wall. Construction is going on in the upper part of the temple, where they are building an enclosure for the 120 foot bronze buddha that was already there. Based on the plans, thousands of 6-foot tall buddhas will also be erected surrounding the statue. The views from the temple was pretty impressive, despite the haze. However, it was too commercialize, with people selling something in almost every corner. 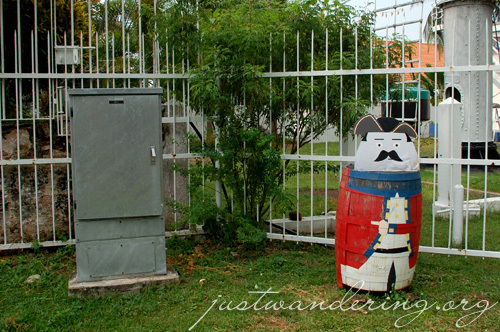 We went back to Georgetown, towards Fort Cornwallis. Going to the old fort made me nostalgic for Fort Santiago in Manila. It wasn’t as big, but it was also right by the sea, had the canons in place, and even a moat around it (though it was removed when there was a malaria outbreak). They even had guards dressed like British solidiers. 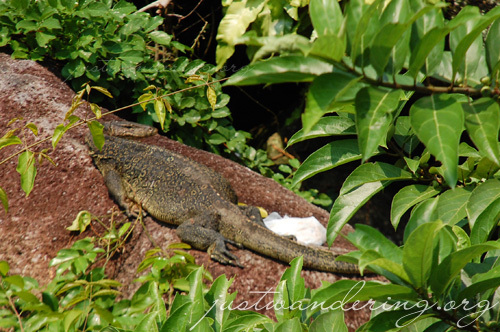 The only monitor lizard sighting. Whew. The sky was looking omnimous again, and true enough, it poured once more when we got to the Burmese buddhist temple. It let up a little, and we were able to cross to the Thai buddhist temple, which also has a reclining buddha, but not as grand as the one in Wat Po. But I was really temple-d out, so I wasn’t really able to appreciate these two. Back in the car we go, and once again we drove out of Georgetown towards Batu Ferrhingi. Batu Ferrhingi is in the northeast side of the island, where the beaches are. That was an interesting drive. One moment we were surrounded by preserved and restored buildings, the next there were nothing but skyscrapers and modern architecture. Driving out of Batu Ferringhi was even more instesting, because just 20 minutes later, were were nothing but the trees and the mountain around us. We ended up driving around the island, passing through Balik Penang, which is the “back” of the island. There were no skyscrapers here, just simple houses and buildings. Another intersting thing about this drive was that in just two hours, I was able to see three different cemeteries (the Christian, Chinese and Muslim), and different places of worship, aside from the different restaurants that take root from different cultures. There’s so much diversity in such a small island, yet they are able to co-exist seamlessly. We had an early dinner at Supertanker, one of the local food court near Wei’s neighborhood. I eagerly ordered for Hokkien mee, and was served something that I wasn’t expecting. Wei explains that the hokkien mee is very different here than the ones that is served in Singapore. True enough, the one that was in front of me was a bowl of noodle soup, while the one I had in Singapore was more like stir-fried noodles. Wei got us this plate of char kwey kok, which was pretty much char kwey teow, but instead of rice noodles, it has these rectangular cubes that was pretty similar to the noodles. For dessert, pancake filled with chocolate and banana. After dinner, we did a very local activity: we went to the mall. Families were out for dinner and groups of friends were hanging out all around. I guess if I was back in Manila, I’d be doing the same thing. There was one interesting restaurant in the Queenstown Mall: the T-bowl. The concept was similar to the Modern Toilet restaurant that I wanted to go to in Hong Kong: patrons sit on toilet bowl (with the lid on, of course), and the tables were bath tubs topped with glass for a table top. Dishes were served in different kinds of toilet fixture to complete the experience. I was back at the hotel relatively early. The lack of sleep the past couple of days was catching up on me, and I was just too exhausted after a full day of sight seeing. I got back just in time, it seems, since I was still able to catch the store at the hotel lobby to print my confirmation e-mail for my next accommodations. With almost everything all set for my trip out of Penang, sank down to my comfortable bed to prepare for another long day of traveling.